Photo courtesy Photorama 2018 Colonel Crawford Eagles football team. NORTH ROBINSON — The Colonel Crawford Eagles have some some big shoes to fill this season. 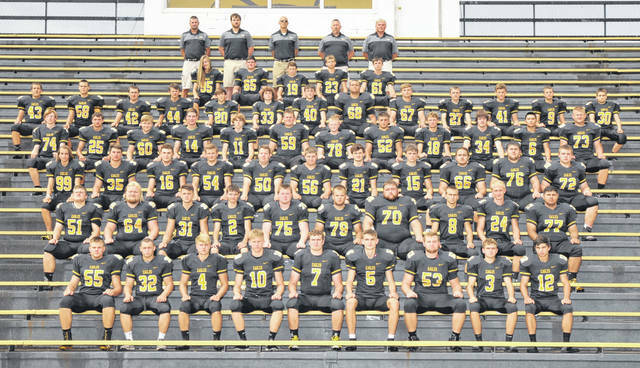 Crawford finished at 5-5 overall last season, including 3-4 in the always difficult Northern-10 Athletic Conference football standings, which was once again dominated by the Wynford Royals. The Royals have won the N-10 in all four years of its existence and remain undefeated in league play throughout. The Eagles finished in fifth place. The big story for the black and yellow this season will be replacing essentially their entire offense from a season ago in the likes of Trevor Shawber and Hayden Bute. Shawber took over the primary running duties after the graduation of Blake Treisch and did so in a big way, rushing for 1,645 yards and 23 touchdowns in 2017, leading to not only earning the league’s top rusher status but also earning first-team, all-conference and Offensive Player of the Year accolades. Shawber was also named to the first-team for his defensive performance last fall. Bute received an honorable mention nod as the team’s primary quarterback after passing for 1,165 yards in his senior season. Also graduating in 2017 and leaving a big void to fill for the Eagles was Kaleb Landin. Landin snagged second-team, all-conference honors on offense as he was the recipient of 31 passes from Bute, good for 672 yards and eight touchdowns. Landin also led the N-10 in punt return yardage (19.8 average) while also picking up an average of 19.2 yards on kickoff returns. Other all-conference performers that walked the stage in the spring of 2018 were: Austin Stevens- first-team (offense); Clint Erwin- second-team (defense) and Spencer Mutchler- honorable mention. In total, the Eagles lost nine players to graduation. But with all of the losses, Crawford welcomes back some key returners, headlined by four seniors. Jacob Maley will be back after receiving first-team, all-defense in 2017 and will be joined by fellow defensive standouts in the likes of Payton Chance (second-team) and Owin Seevers (second-team). In addition to his defensive nomination, Seevers also led the N-10 in kick return average at 24.5 yards. Also back after receiving all-conference honors will be Jonah Studer, who received second-team honors for his work on the Crawford offensive line. Head coach Ryan Teglovic, who is entering his 12th season (66-39 record), will return eight letterwinners on both sides of the ball, including six starters on offense and seven on defense. Colonel Crawford will start their 2018 campaign on the road against the Mount Gilead Indians on Friday, August 24. In week two, the Eagles will play their first home game of the season when they welcome the North Union Wildcats to town. N-10 play will begin on Friday, September 14 when the Upper Sandusky Rams head to Crawford to meet up with the Eagles for their homecoming game. https://www.galioninquirer.com/wp-content/uploads/sites/38/2018/08/web1_Crawford-football.jpgPhoto courtesy Photorama 2018 Colonel Crawford Eagles football team.